I remember making so many pom poms as a kid. 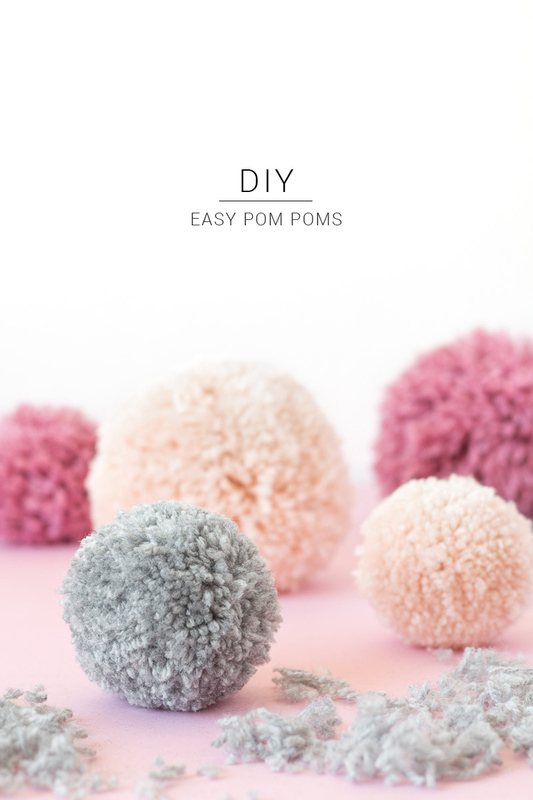 There are many ways to make pom poms, ranging from fancy pom pom makers to making mini ones on a fork. 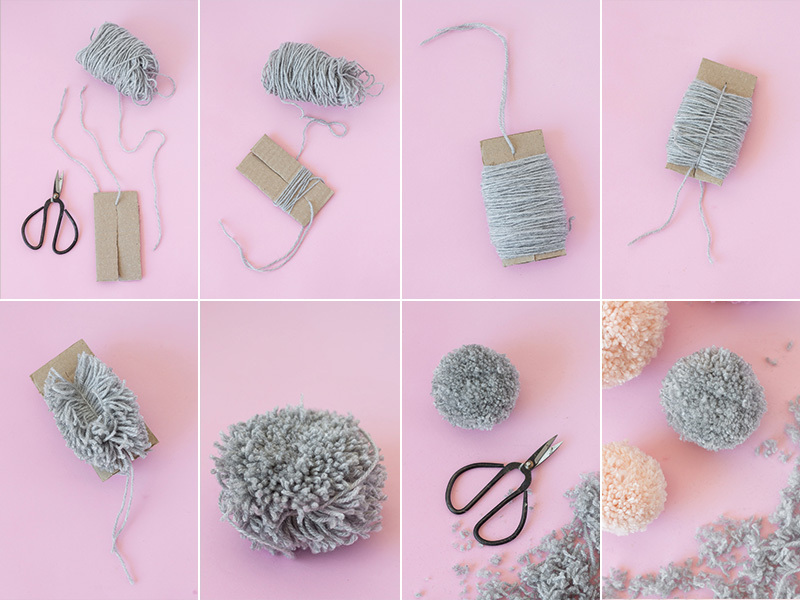 The only pom pom makers I’ve bought were an absolute waste of money and the round handmade cardboard ones I grew up making always become a pain when you have to keep slipping the wool through one tiny little gap. It got me thinking. 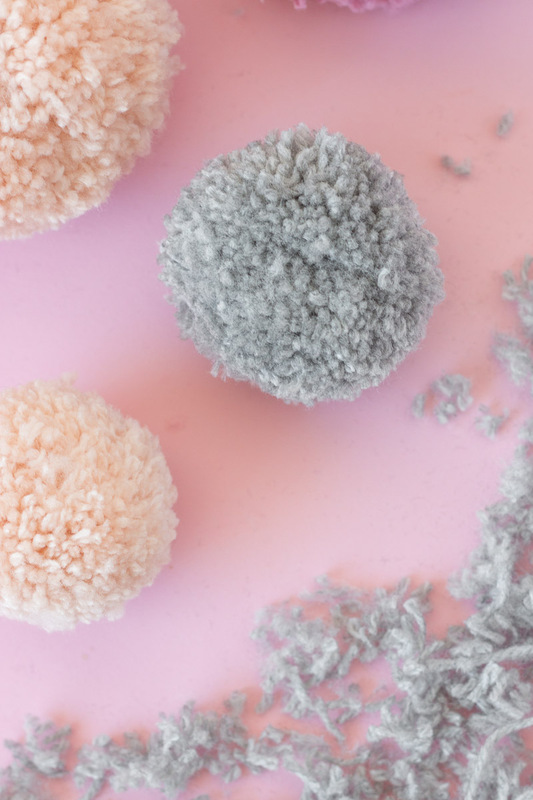 Although pom poms are round, does the template actually have to be round? No, it doesn’t! I’ve got the easy steps for you right here. 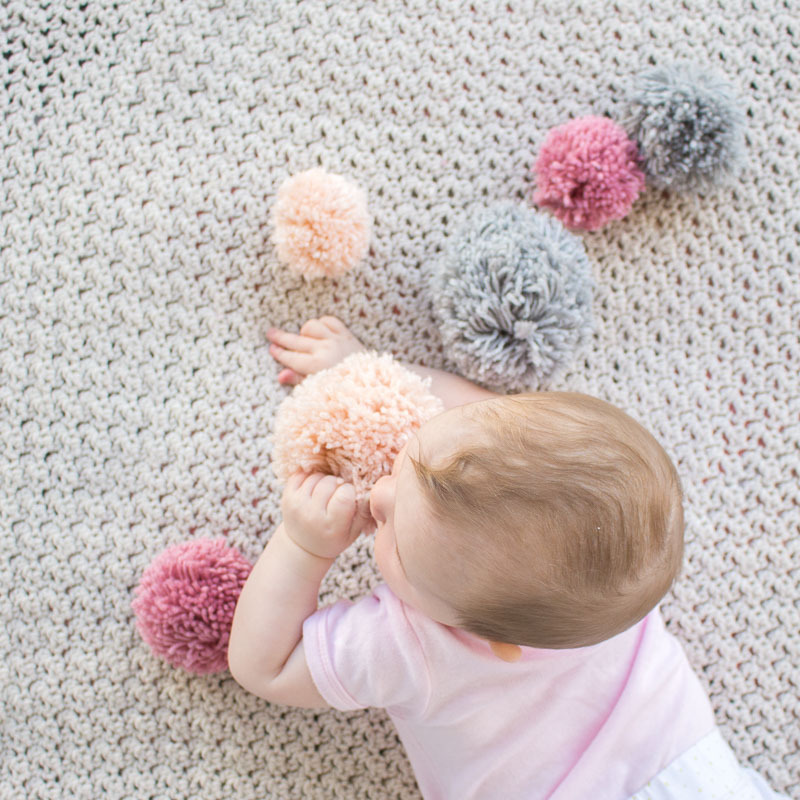 Pom poms are so versatile, they’ve been popping up everywhere! I was looking for a fun way to take our little one’s monthly photos without having an actual “1”, “2” etc in the photos. My solution? Each month I’ve added an extra pom pom, so you can tell her age by counting the pom poms, but the photos can also just be used as random pretty pics. The bonus is they also act as entertainment when she doesn’t actually feel like posing for the photos! Start by cutting a rectangle of cardboard. The full width of the rectangle will be roughly how wide your pom pom ends up. Cut a slit up the length of the cardboard and slide a piece of wool right up to the end. Start wrapping wool around the cardboard and just keep going. Be sure to keep your first piece of wool safely out of the wrapping. SECRET #1 TO FULL POM POMS: Keep wrapping the wool until you’re convinced you’ve got more than you need. Take your first loose piece of wool, pull it down around the wrapped wool and tie it simply. This needs to be tight enough to hold the wool together in the next step, but still able to be tightened as you go. Cut down each side of the wrapped wool. Once both sides are cut, pull your knot as tight as possible. Gently slide your pom pom out from the piece of cardboard. Don’t worry about the funny shape. Again, pull the knot as tight as possible and secure it with a second knot. SECRET #2 TO FULL POM POMS: Trim, trim, trim! Seriously, trimming it makes all the difference between a funny lopsided mess and a full round pom pom. I’d love to see your Pure Sweet Joy DIYs. Show me on Instagram using #puresweetjoyblog or email me at deborah [at] puresweetjoy [dot] com. Like what you see here? Follow along on Facebook or Bloglovin or subscribe to the newsletter for exclusive access to the latest news and freebies. « Have you seen our shop?